For Adam and Sarah Hansen, comic books are for telling unique and engaging stories, not stockpiling as collector’s items. The married couple’s new business venture, Rivertown Comics & Games, is the epitome of that philosophy, offering a range of comics and graphic novels from big publishers to independent artists. While half of the store is dedicated to comics, the other half features shelves of tabletop games — something the Hansens said has become a big part of their social life. Customers won’t find traditional games such as Monopoly or Sorry, her husband noted, adding the focus is on more complex titles the likes of Eldritch Horror — published by Minnesota-based Fantasy Flight Games — and Settlers of Catan. The plan is eventually to open part of the store for people to play games and a library of games to try out, they said. Also for sale is a variety of plush toys, pins and other gifts. Sara and James Carfora, who brought their sons to the grand opening, said they are excited for a comics and games store to open in Red Wing. The parents said they are getting into the Dungeons & Dragons roleplaying game and the children are into Pokémon cards. There are few options for dedicated comics and games retailers outside of the Twin Cities, with fans in southeastern Minnesota having to drive upwards of an hour to the nearest shop. 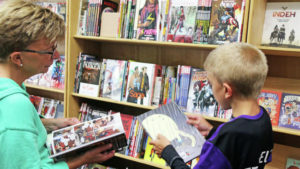 “That just isn’t acceptable for people who are very into comics,” many of them who go weekly or once a month to pick up the latest titles, Sarah Hansen said.